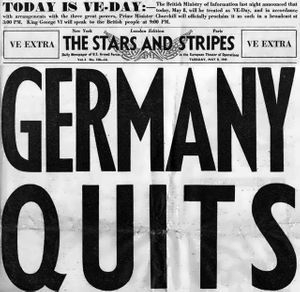 The news of Germany’s defeat and acceptance of unconditional surrender terms which the world had so long awaited came in this historic month. A month that will live in history, a month that will never be forgotten. Most of us in the group took the news calmly enough, knowing that a great number of us would still have a long road to travel before final victory over the Japanese. Let us not give the impression that there was no joy, celebrating, etc., because there was. Unfortunately most of us were restricted to the base for two days beginning V-E Day and could not join the local people in their big celebration, but gaiety reigned at The Officer’s Club, The Red Cross, in the barracks and at The NCO Club. The boys felt bitter about this restriction, but for those who sat down and analyzed the reasons for such a restriction, the motives were clear. As we draw close to the completion of our stay in the ETO, let us review briefly our record as a heavy bombardment group in the finest air force in the world. The group has participated in four campaigns, namely, “AIR OFFENSIVE EUROPE” 57 missions; “NORMANDY” 45 missions; “NORTHERN FRANCE” 33 missions; and “GERMANY” 105 missions. For outstanding performance, the group has been cited three times by 2nd Air Division, once upon completion of its first 100 MISSIONS, secondly for the destruction of an important RR bridge at BLOIS ST DENIS, FRANCE, and thirdly for the completion of 200 MISSIONS. In addition to our operational missions, we were given the highly important task of ferrying gasoline to France. During the month of September 1944, when our armored forces were in dire need of this precious fuel, we were called on to assist in getting the gasoline to the Continent. 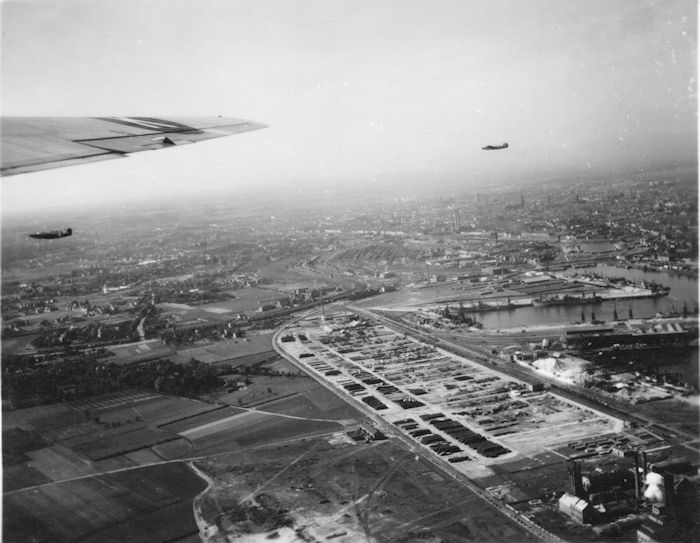 Our ports of call were three airfields, namely ST DIZIER, CLASTRES and LILLE, FRANCE. The element of danger in carrying large quantities of this highly inflammable fuel in aircraft cannot be overestimated [sic]. The gigantic task of modifying the A/C, installing gas tanks and setting up an operation system, both here and on the Continent, was accomplished through the efforts of both the ground and air personnel. Every man on the base was called on to sacrifice his free time in order to help facilitate in the transportation of the fuel. 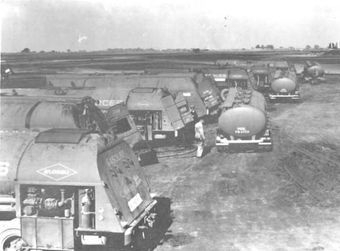 A system was devised whereby the moment a British tank truck drove onto the field, the gasoline was transferred immediately into our own refuelers, thence into the tanks installed in the aircraft. There was no letup in our work, this procedure was carried on both day and night. In exactly 16 days the aircraft of this group ferried 727,160 gallons of gasoline to the Continent, and by so doing, materially aided the armored forces to proceed with their drive towards the Rhine, and as we now know it, final victory in Europe. The group can well be proud of its achievements and we are looking forward to further distinguishing ourselves in the southwest Pacific campaign. The inevitable task of getting ready for movement went into motion the minute victory was proclaimed. Instructions from higher headquarters came down regarding the modification of our A/C to meet with ATC standards. Instructions for disposition of material and equipment were received, and the station went into a state of feverish activity. No line personnel could be spared for other duties, so the combat personnel who had very little to do, were drafted for duties [that] ordinarily called for ground personnel services. The “get-ready” program called for concentrated efforts by every man on the base. Physical exams were given, all men brought up to date on inoculations, dental repairs, etc. For the first time since we arrived we were allowed to close the envelopes containing our mail to the States. That in itself was quite a thrill for most of us. There were quite a number of interesting innovations [that] happened during the month. The most welcomed being our “Trolley” missions to Germany. The purpose of the “Trolley” missions was to provide the privilege for all ground (non rated) personnel, of seeing from the air, their contribution to the strategic air war. The targets to be visited by air were all assigned and destroyed targets attacked by the group. Each A/C carried ten passengers and five crew members. The whole plan was carried out as if it had been a real operational mission. The squadron operations prepared loading lists on all personnel, both passengers and crews were awakened [and] told to be at the briefing hut at a specified time. An S-2 officer had prepared a complete briefing on the route – having Balopticon slides on all targets – before and after attack, plus the importance of them and the group’s part in their destruction. Our fist mission was labeled “The Rhineland Tour” which covered such towns as DUSSELDORF, COLOGNE, KOBLENZ, FRANKFURT, etc. Our second tour was over northwestern Germany, covering HAMM, HAMBURG, BREMEN, etc. 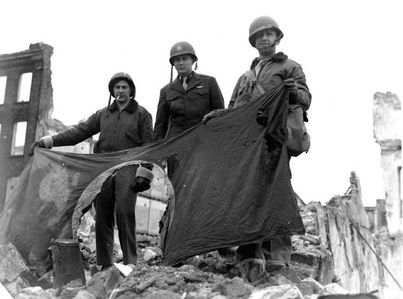 The S-2 section helped immeasurably by preparing a “poop” sheet on the interest of the towns, what they were famous for, populations and general notes of interest. They also prepared a map showing the route, and both the “poop” sheet and map were mimeographed and given to each passenger at briefing. They proved to be of immense value to the Paddlefoots, who for so many [this was] their first trip in the air. After the S-2 briefing, the personnel equipment officer then reviewed the usages of the Mae West, parachute and inter-phone, and last of all, a word on ditching procedure. All loading lists were then checked and each passenger given the A/C No., pilot, revetment No. and station and take-off time. The entire plan was a huge success. Many a ten-page letter was written home on this marvelous trip, many a “bull” session was held and notes compared. There is no doubt in our minds, that this has been the biggest morale booster ever offered the ground personnel. We flew 6 missions on the following dates: May 7, 8, 9, 10, 11 and 12, dispatching 105 A/C and giving 1047 passengers the thrill of their life. During the missions there was not one single accident nor were there any fatalities. The “poop” sheets on both tours are appended. For those officers of this command who had done such an excellent job in key positions and as command pilots, the grateful French government decorated them with the Croix de Guerre with Palm, at ceremonies held at 2nd Air Division Headquarters. The awards were presented by LT GEN MARTIAL VALIN, Chief of Air Staff for the French Air Force. Soon after VE Day, we became garrison, much to our sorrow. Gone was the excitement of preparing and sweating out a combat mission – it was all over now. Extensive plans went into effect to keep everyone busy – not that packing equipment, destroying old records, and modifying the A/C was not enough to keep us all busy, but just to get us into the feel of being soldiers again. Physical training, close order drill, marching to duty in formations, etc. Then too, we were awakened in the morning by the sound of reveille coming over the Tanoy system. During the day a schedule of calls was played on the Tanoy system, and we felt a bit sorry for the happy days of excitement that was to be forever just a memory of our gallant record of achievement in the ETO. We received a warning order with the tentative plans for the air echelon to leave for the ZI beginning the 9th of June. Inasmuch as these were only preparation orders we do not think it feasible to go into details on them at this time. Our next installment of the group’s history will be written back in the States and will include all details of the movement of the group and the closing of Station 123.